Malenki writes in his diary about a list of the 240 user names newly registered in OSM. This issue was raised on the website here. Mapping female versus male street names: A team from Mapbox has studied the number and distribution of streets named after people according to gender in order to analyse the social hierarchy of cities. Martijn van Exel has obtained permission from CrossCountryRoads.com to use the images for mapping. He asks to look out for other sources that might be used for the same. Mark Bradley also got permission for aaroads.com (via talk-us). Martijn describes in his diary how he uses the data from those websites to map highway exit details. Nate Smith tweets about the recently redesigned fresh user interface of openaerialmap.org (still in beta). User pizzaiolo wonders how the recently introduced fast walking lanes in Liverpool should be mapped. User Oini starts her mapping journey by mapping her hometown Chandannagar on OpenStreetMap. Martijn van Exel published the “missing manual” of the TrafficFlowDirection JOSM plugin. In the continuing “Mapper in the Spotlight” series, Escada publishes his interview with the mapper Dave Corey from Ireland. User Glassman wants to rewrite the welcome page to encourage more participation from the newly registered users on openstreetmap.org. He is asking for more suggestions. The Dutch community discusses (English) the data from the 3dShapes import. The data is from around 2002 and of course the landscape has changed since then (but was it accurate before?). The discussion continues on whether the data should be imported from newer sources or should be manually updated. John Willis explains why the current OSM-based maps are not useful for map-based navigation in Japan. He further elaborates about this in another post. Joost Schouppe has some statistics on the evolution of data density in the different Belgian regions. User JAT86 explains that he has left the Wikimapia project in favour of OpenStreetMap, and gives the reasons for his change. Ramyaragupathy reports about Mapbox’s progress in the correction of Japanese road alignments (also reported previously). Andy Wilson would like to import buildings in Austin, Texas. See also the wiki page for the proposed import. Nicholas Doiron asks for help, tips or feedback on a dataset containing townships in Myanmar. Board Elections – there are four seats available, but only four candidates have applied so far? Candidates can contest for the elections until 21st November, 16:00 UTC. In previous years there has been a “late run” of applications. Here are the questions for the candidates. Originating in 1999, the annual GISday, which was started by Jack Dangermond (president and co-founder of Esri), will this year take place on the 18th of November. It will feature many events all over the world. A Mapathon in Madrid will be held on the 21st of November 2015 (English). OpenStreetMap for Disaster Management, a Slideshare presentation by Yantisa Akhadi, Team Manager at Humanitarian OpenStreetMap Team Indonesia. User MorbZ announces (via the OSM Forum), that he has developed a Restriction Analyzer (about turn restrictions) which uses the Overpass API. A main features of it is the ability to find unnecessary restrictions. The map in this blog shows all the bridges in the Hamburg area. By clicking on the name of the bridge, the an information box opens and it links to a separate detailed blog of that particular bridge. Mapworks is a tool which helps in designing fast and pretty map design using data from the wonderful OpenStreetMap. This alpha version allows maps to be downloaded as PNG images and SVG files. The blog “Maps curious about food“, shares the idea of making maps with food. It also shows map of food production , etc. (English). Following the release of high resolution height data from LIDAR measurements for England (as reported in OSM weekly No 274), equivalent data has now been released for Wales. The data has been released under the UK Open Government License. The Department of Agriculture, Food and Forestry in Oklahoma released the 2015 NAIP imagery (National Agriculture Imagery Program). Simon Poole informs the talk mailing list about the progress on the Collective Database Guideline. In a detailed blogpost, Susan Crawford explains the history and the background for the Android App Nearby Explorer Online. It’s a “audio map” that helps blind and visually impaired people with outdoor navigation using either Google or OpenStreetMap data. On Graphhopper’s blog there is a description of how they solve the famous “Traveling Salesman” problem. Eike Beer reports how to set up a development version of OpenRailwayMap which uses the vector tiles provided by openrailwaymap.org. … HOT kits – They are comprised of laptops, GPS units, a printer scanner and an assortment of pieces to hook it all together, they allow people to continue contributing to OpenStreetMap even after the H.O.T. team has left. 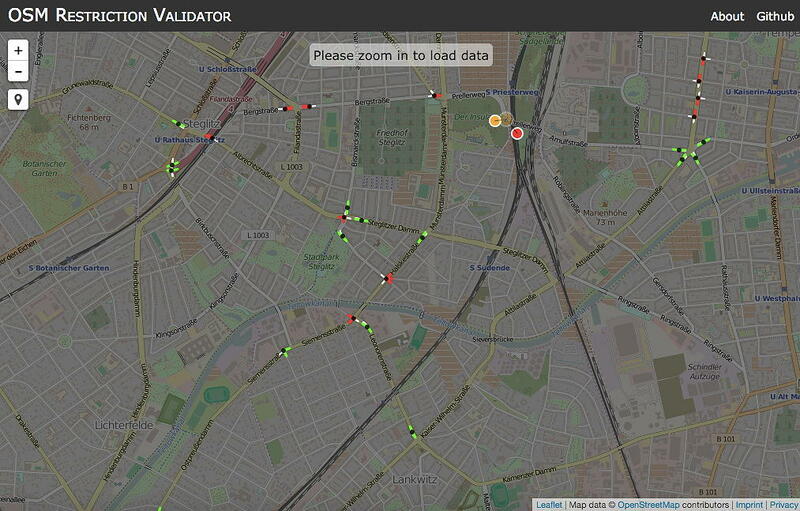 … the QA tool “Node network analysis” for analysing Belgian and Dutch cycle and walking networks. Mapbox is blogging about technical way to sharpen Landsat8 satellite images. There as been a lot of attention about the diminishing Arctic sea ice in recent years. The goal of this blog by Bjørn Sandvik, was to show the changing sea ice month by month, and even day by day. OpenSolarMap is a crowdsourced project to find the best roofs to place solar panels. It’s one of the projects of the Climate Change Challenge. Don’t hesitate to start! Click the roof!